BeachHouse announces a new board book for kids ages 0-3, written by Lavonne Leong and illustrated by Jing Jing Tsong. 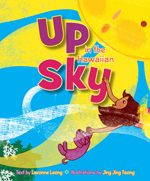 Beautifully written by author Lavonne Leong and illustrated by Big Island artist Jing Jing Tsong. A perfect bedtime story to settle the day and think about all the things you’ve seen during the day — both big and small.